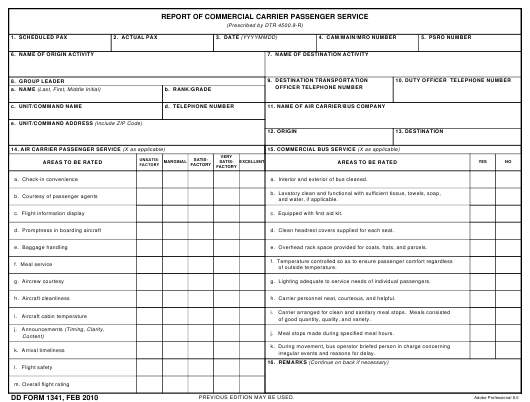 DD Form 1341 - also known as the "Report Of Commercial Carrier Passenger Service" - is a Military form issued and used by the United States Department of Defense. The form - often incorrectly referred to as the DA form 1341 - was last revised on February 1, 2010. Download an up-to-date fillable DD Form 1341 down below in PDF-format or find it on the Department of Defense documentation website. a. Interior and exterior of bus cleaned. c. Equipped with first aid kit. d. Clean headrest covers supplied for each seat. e. Overhead rack space provided for coats, hats, and parcels. g. Lighting adequate to service needs of individual passengers. h. Carrier personnel neat, courteous, and helpful. of good quantity, quality, and variety. j. Meal stops made during specified meal hours. irregular events and reasons for delay. 1. Serve as the intermediary between all group members and carrier representatives. 2. Responsible for handling of GTRs and any other accountable documents. fide employees of the carrier. 4. Properly dispose of any unused GTRs or other accountable documents. 6. Notify originating and destination TO in the event of unusual delays. criteria listed. Contact the TO on any disputed items. 8. Annotate meal ticket with actual number of meals provided. 9. Notify TO when any personnel are hospitalized, deceased, or missing. 10. Complete the DD Form 1341 and turn in to the TO.